Call today and arrange A viewing, we are open 7 days A week until late every day, call today on of leicester.We are pleased to offer to the market, a rare mixed use property located onMaidstone Road near ring-roads, Leicester.177 Maidstone roadcomprises alock up retail unit(including a shower and w/c, basement with drainage) on the ground floor. On the first floor, there isfour bedroom, 2 bathroom flat, (previously twoflats, which can easily be reverted.) there is large storage unit at the rear which can be used for alternative uses STPP.179 Maidstone road consists of a large open plan cafe/lounge on the ground floor, a 3 bedroom flat with large living room, kitchen and 2 bathrooms on the first floor and further space in the loft with good head height. 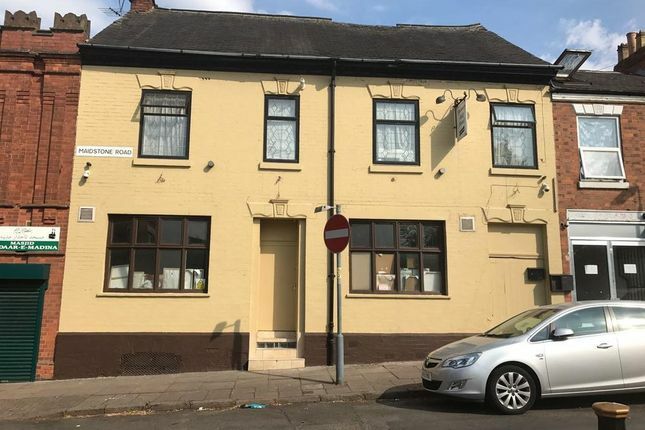 To the rear there are 2 outbuildings which can used for various uses STPP.Located 3 doors away from a playground, mosque, church andschool, walking distance from shops, retail park, train station (11 mins walk)and Leicester City Centre.We believe both propertiescould be converted to provide 14 self contained flats collectively, STPP. Property descriptions and related information displayed on this page, with the exclusion of Running Costs data, are marketing materials provided by Online estate agents.com, and do not constitute property particulars. Please contact Online estate agents.com for full details and further information. The Running Costs data displayed on this page are provided by PrimeLocation to give an indication of potential running costs based on various data sources. PrimeLocation does not warrant or accept any responsibility for the accuracy or completeness of the property descriptions, related information or Running Costs data provided here.